Lamborghini CEO Stephan Winkelmann with the Aventador J in Geneva. 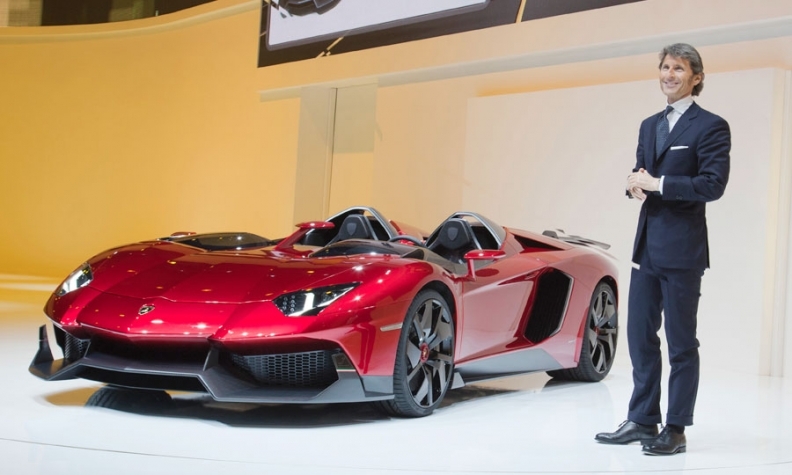 LONDON (Bloomberg) -- Lamborghini CEO Stephan Winkelmann said global demand for ultraluxury sports cars will probably not increase next year as the European debt crisis drags on and China's economy slows. "We are very cautious for next year," Winkelmann said in a Bloomberg Television interview in Singapore. "The Europe crisis is not over." The maker of the 2.1 million-euro ($2.7 million) Aventador J supercar is expanding in markets including Singapore and Hong Kong to make up for slower sales in Europe and China. The Italian supercar maker opened a second dealership in April in India, where the number of millionaires will more than double by 2015, according to Julius Baer Group Ltd. and CLSA Asia-Pacific Markets. Demand in Hong Kong, Singapore and Southeast Asia continues to grow, said Winkelmann. Lamborghini's sales are "a bit below last year" in China, its second-largest market after the U.S., he said. Demand in the United States is recovering and globally there's a waiting list of as long as 18 months for the Aventador, he said. The ultraluxury unit of Volkswagen Group hasn't made the decision whether to introduce an SUV, Winkelmann said. Lamborghini unveiled an SUV prototype -- the Urus -- at the Beijing auto show this year. "This is a broader decision of the group, we hope it's going to come soon," the CEO said. "To engage in such a project, it's adding a third model, and for us, this will be a huge step and huge investment."